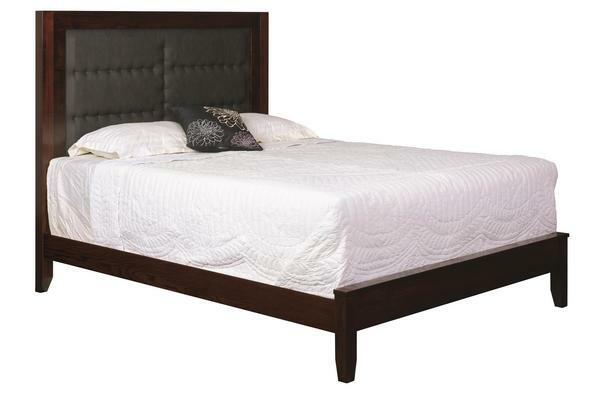 The Amish Contemporary Bed with Leather Headboard adds a stunning focal element to a master bedroom or guest room. Solid wood styling is simple and natural, with the main event being the leather headboard. This contemporary style bed is one that can adapt to design changes over time. That combined with fine craftsmanship and solid wood, make this contemporary bed one that will stay in your family for generations. Choose from a twin, full, queen or king size for your new bed. Options for the leather headboard come in a variety of colors, with Fog, Taupe and Red Velvet among the many options. Choose a standard or low sheen varnish as well as the wood type for a custom bed built exactly the way you want it. Email or call one of our Furniture Specialists with any questions, toll-free at 866-272-6773. Enjoy complete bedroom sets from our Shop the Look Collection.